← An Investigation of Eight Samsung Factories in China: Is Samsung Infringing Upon Apple’s Patent to Bully Workers? 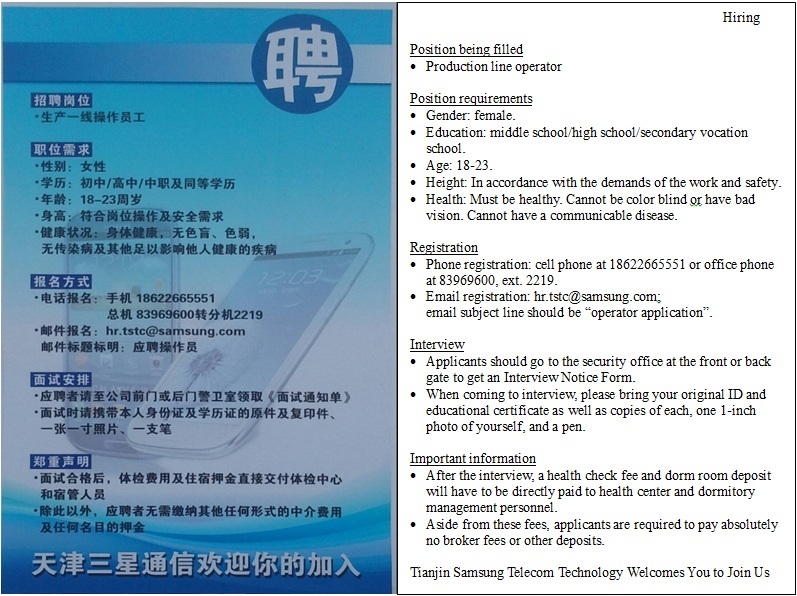 (New York) Today, China Labor Watch (CLW) has released a hiring announcement found at a Samsung factory called Tianjin Samsung Telecom Technology (TSTC) that clearly demonstrates the illegal discrimination imbued in the hiring practices at Samsung factories in China. Samsung’s announcement is below. On September 4, CLW published a report on the myriad labor abuses at 6 Samsung-owned and 2 supplier factories in China. Samsung responded to this report on September 7, claiming that “We are in full compliance with all laws related to child labor, forced labor and workplace discrimination.” [Link] And in an earlier statement, Samsung said “Samsung abides by all labor and human right laws in each region it operates”. These statements are simply not true. Furthermore, the factory in question above, TSTC, which has over 6000 workers and produces Samsung cell phones, is 90% owned by Samsung and is directly managed by Samsung. It is impossible that Samsung does not know about the illegal hiring practices at its factory. Thus, we can only conclude that Samsung, in their previous statements, has being lying to the public about the lawful treatment of its workers.